This dog, named Putiputi Rapua, has been trained to lie down when she smells a lizard. Here, she has sniffed out her training partner, a common gecko called Gerald. 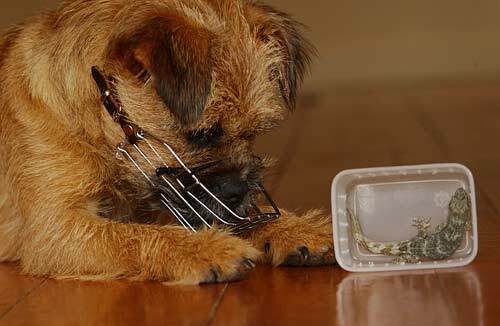 The border terrier was one of two dogs being trained for use by the Department of Conservation in 2004. Because many New Zealand lizard species are nocturnal, it has been difficult to study them. Researchers hoped the dogs’ keen sense of smell would bring them greater success in finding lizards.